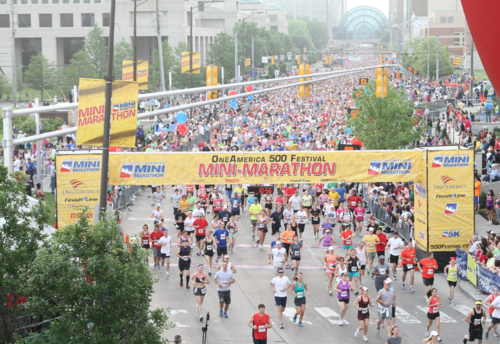 My Run: Overall, the One America 500 Festival Mini-Marathon (“the Mini”) in Indianapolis was my 12th half marathon. 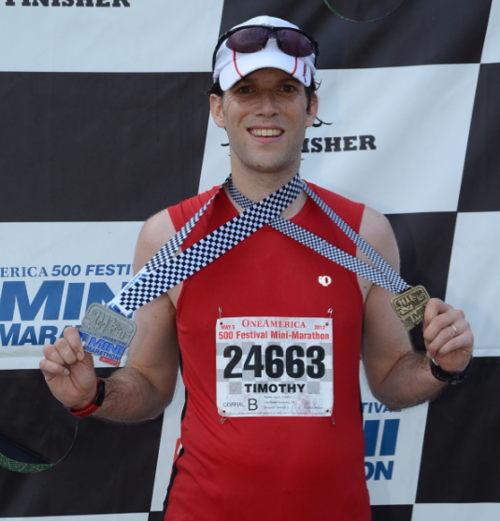 This was the fourth year in a row that I have run the Mini, which is the largest half marathon and fifth largest road race in the U.S. with 35,000 runners. The Mini is part of the month-long 500 Festival that leads up to the Indianapolis 500. 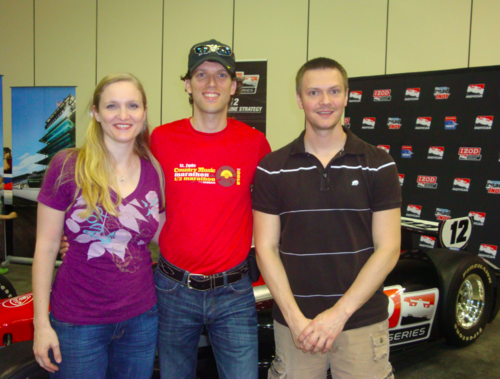 I traveled to Indianapolis with my wife Olivia and my good friend Paxton. 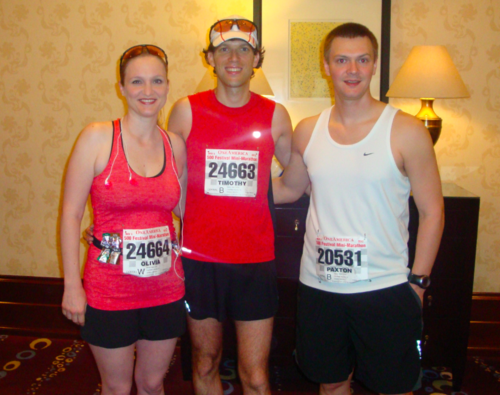 Olivia and Paxton had both run the Mini with me in 2011 and Paxton set his current half marathon PR. Paxton and I started the race together in the seeded corral B. 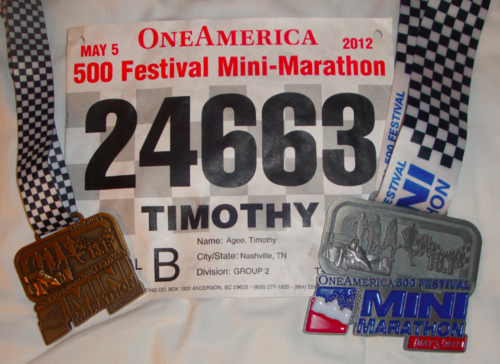 For this year’s race I had two goals. The first goal was to finish in the top 500 and receive the special “500 Club” medal in addition to the regular finisher’s medal. The time required to fall within the top 500 varies from year to year, but is usually between 1:27 and 1:33 depending on the conditions. My second goal was to break 1:28 as a finish time. 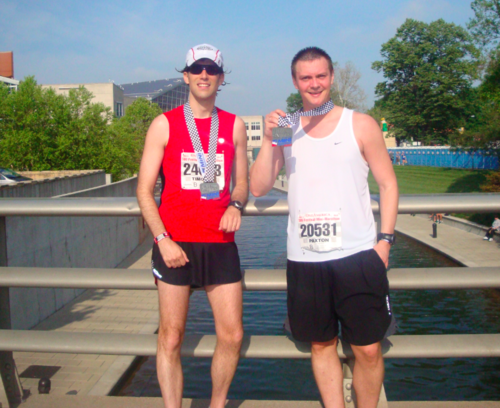 My PR is 1:29:52, which was at the very hilly Oak Barrel Half Marathon in April 2012. I felt pretty confident that in ideal weather conditions I could hold a 6:42 pace throughout the very flat Mini course based on how my training has been going over the past 8 to 10 months. However, my hope for ideal weather conditions did not come to fruition. 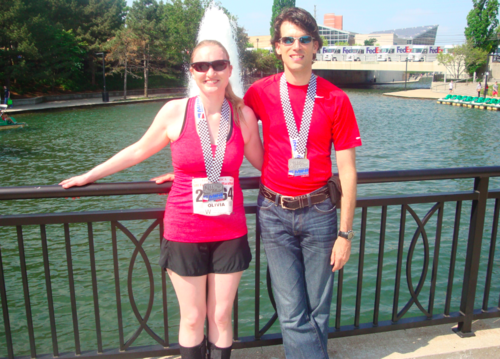 Although the temperatures were tolerable (mid 60s at the start and low 70s at the finish), the humidity was ridiculous. 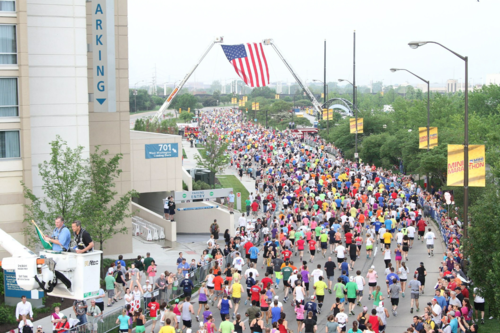 According to the Indianapolis Star the average humidity during the race was 91%, what had a big impact on most of the runners in the race. Knowing that conditions would be tough, I tempered my expectations and decided that I would just take what the day had to offer. My plan was to start off with a pace in the 6:50s and then adjust from there as necessary. Even though I started in the same corral as Paxton, I tried to focus on running my own race and separated from him pretty early in the first mile. I expected my first mile to be pretty slow since there is usually heavy congestion at the beginning. However I stuck to left side of the road at the start and was able to run pretty much un-impeded from the outset. Since I also felt very good I started off too fast and ran both of the first two miles in the low 6:40s. 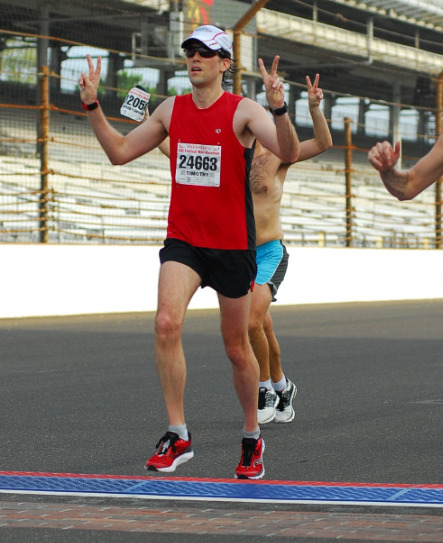 By the third mile I was already sweating profusely and knew that I had to slow down in order to finish the race. From that point through mile 5 I averaged right around 6:50 pace. The humidity was difficult and I just couldn’t get comfortable with my pace, my running rhythm, etc. 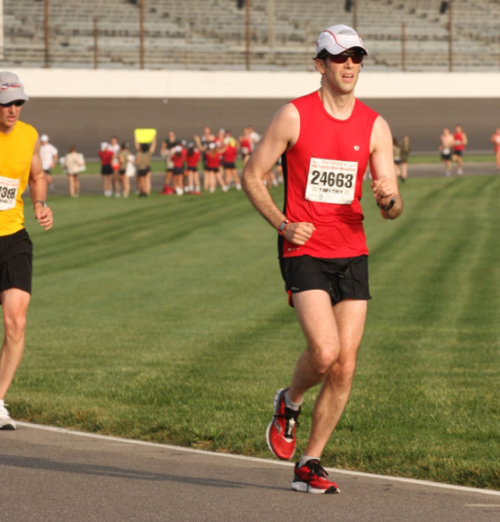 During mile 6 we headed into the Indianapolis Motor Speedway and immediately started running into a steady headwind. 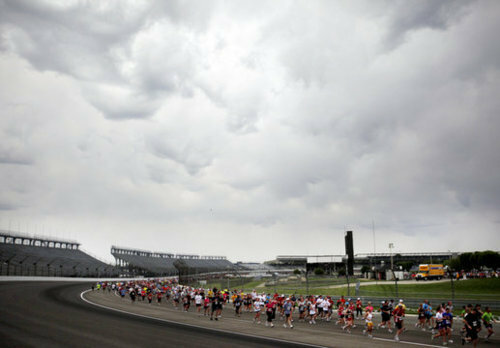 I got a bit of a boost as we started running on the track surface when I saw that the leaders were still on the track. This really stood out to me because in my first Mini back in 2009 they were already interviewing the men’s and women’s winners on the speedway JumboTron as I ran around the track. It made me feel good to know how much progress has been made since then. Even though I got this boost and started feeling better on the track, my pace slowed to around 7:00 for miles 6 and 7 as I ran into the wind. During mile 8 we turned back down the front straightaway, running with the wind, and I started feeling fantastic. My pace dropped back down to 6:55, and I began to think that I would be able to “blow it out of the box” for the rest of the race if I kept feeling that good. However as we left the track during mile 9, the humidity again slapped me in the face and I started to wilt. I was able to keep the pace in the high 6:50s for miles 9 and 10, but my pace slowed to 7:15 during miles 11 and 12, and everything in my body was screaming for me to stop and walk. At every water station from mile 6 forward I had been drinking one cup of water and pouring another on my head. By this point in the race we were in full sun and I started to really fade. 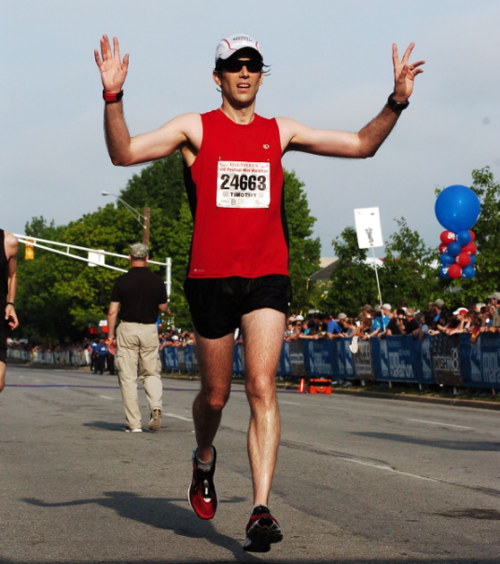 Even though I wanted to walk, I kept telling myself to not let my pace drop below marathon BQ pace (7:16). I am glad that I was able to keep it just above this point. For the last mile I got a boost from the energy of the spectators and picked up the pace a bit to 6:58. When I saw the finish line I put everything I had left into the last 1/4 mile hoping I would still be one of the top 500. I heard the announcer say my name and then crossed the finish line with a time of 1:31:28, which was 32 seconds faster than my finish in 2011. This was short of my original goal, but I’m ecstatic with this finish considering the conditions. Just after crossing the line I saw the coveted “500 Club” medal in the hands of one of the volunteers ahead and they placed it around my neck. Even though I was exhausted I gave a fist pump as I received the special medal, and then quickly headed over to receive the standard finishers medal, grab some fluids, and cool off by one of the big water fans on either side of the finish area. My final time was good enough for 419th overall out of 31,181 finishers which is within the top 1.3%. Friends and Family: Like me Paxton had a pretty ambitious pre-race goal that had to be modified due to the humid conditions. Last year he had set his current PR of 1:31, and this year he was hoping to break 1:30 for the first time. However, with the humid conditions he ran more conservatively and finished with a very strong 1:36, which was good enough for 817th place which was top 2.6% of finishers. Awesome! Last year’s Mini was Olivia’s final race before being diagnosed with bi-lateral tibial stress fractures and being sidelined from training for 5+ months. This year’s Mini was her second race since returning from the injury, with the first being the NOLA Half Marathon back in March (where she set a PR). For this year she had hoped to be able to PR again, but with the high humidity and some lingering shin issues, she also decided to take a more conservative approach. Even with all of this she still improved on her 2011 effort in the Mini by almost a full minute with a finish time of 2:45. Great work baby! Another highlight of the trip for me had very little to do with the race. 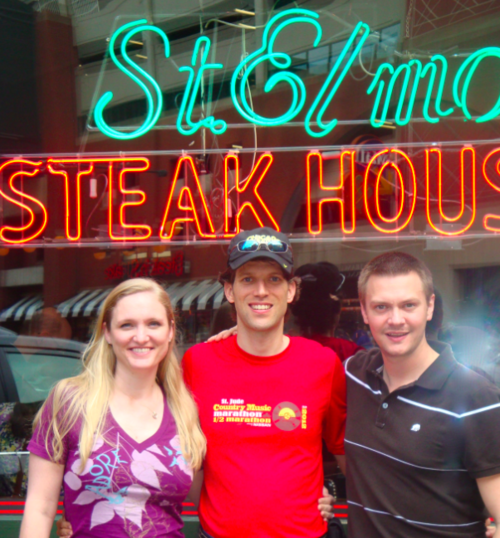 It was having dinner on Friday night at the esteemed St. Elmo Steak House with Olivia and Paxton. This restaurant is known for having ridiculously strong cocktail sauce and excellent steaks. We each gave the shrimp cocktail a try, and it was REALLY strong, but I LOVED it! Everything else was really good too, and it was a cool atmosphere. Not exactly carb-loading before the race, but it was enjoyable none the less. The Race: Overall It is hard to come up with many criticisms of this event. The organization from the expo to the finish area is impeccable. The course is flat and very unique (see more below). All Mini participants received an long-sleeve technical t-shirt, and a technical running hat (both were much better than prior years). The finisher’s medal for 2012 is a really cool design that incorporates an Indy car with elements of the Mini and speedway. The “500 Club” medal is just a smaller version of the normal medal and is a copper color.